6.2 Why are the agglutinates useful? 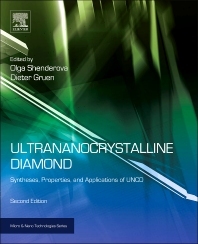 Ultrananocrystalline Diamond: Synthesis, Properties, and Applications is a unique practical reference handbook. Written by the leading experts worldwide it introduces the science of UNCD for both the R&D community and applications developers using UNCD in a diverse range of applications from macro to nanodevices, such as energy-saving ultra-low friction and wear coatings for mechanical pump seals and tools, high-performance MEMS/NEMS-based systems (e.g. in telecommunications), the next generation of high-definition flat panel displays, in-vivo biomedical implants, and biosensors. This work brings together the basic science of nanoscale diamond structures, with detailed information on ultra-nanodiamond synthesis, properties, and applications. The book offers discussion on UNCD in its two forms, as a powder and as a chemical vapor deposited film. Also discussed are the superior mechanical, tribological, transport, electrochemical, and electron emission properties of UNCD for a wide range of applications including MEMS/ NEMS, surface acoustic wave (SAW) devices, electrochemical sensors, coatings for field emission arrays, photonic and RF switching, biosensors, and neural prostheses, etc. Ultrananocrystalline Diamond summarises the most recent developments in the nanodiamond field, and presents them in a way that will be useful to the R&D community in both academic and corporate sectors. Coverage of both nanodiamond particles and films make this a valuable resource for both the nanotechnology community and the field of thin films / vacuum deposition. Written by the world’s leading experts in nanodiamond, this second edition builds on its predecessor’s reputation as the most up-to-date resource in the field. R&D community (academic and corporate) and engineers in the fields of nanotechnology, materials, thin films, deposition, biomedical engineering, optics, proteomics (protein chip technology in genomics), semiconductors, pharmaceutical, biotechnology and MEMS / NEMS.